First Line:"I did not arrive at the convent of Saint Mortain some green stripling." Review: Sybella was very interesting her background history was actually a lot more interesting than even Ismae's which I expected as much seeing how she already had me so curious about her from the first book in the series. As for the romance there was Beast, he was perfect for Sybella although the girl did keep reminding us how ugly he was and it became a little annoying but she loved him and their romance was sweet. 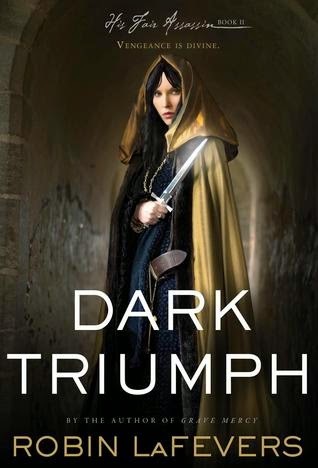 Dark Triumph unlike the first book focused less on the actual plot and court politics and more so on the personal history of Sybella which was interesting and I liked learning about her past but I still wish it was more focused on the plot. One thing I have confirmed is that the Abbess is as horrid as I thought but still haven't learned much about her hidden agenda (if she has one) or maybe she just gets off on being so cruel, so can't wait to read the next book and hopefully get some answers about what is up with her. Overall I can't say I loved Dark Triumph mainly because I had some seriously high expectations for it after reading Grave Mercy. I did feel like it took me a bit longer to really get into the story but I still enjoyed it and will be buying the next book in the series very soon.